At Local Natural Foods we spend a lot of time traveling around Arizona in search of those great local foods. In our travels, we get to see the more spectacular parts of Arizona. For example last week a few of us had ventured up north to see if we could locate a man who sells Arizona Pinon nuts. Unfortunately we weren’t able to locate him, but it did give us the opportunity to take the back way home through Payson, and do some hiking near Mazatzal Peak. The sunset was beautiful, and it gave us a chance to reflect on how lucky we are to have the jobs that we do. After some discussion, we came to the conclusion that we do a fairly good job sharing our local food discoveries with our customers and friends, but we do a decidedly poor job sharing the other treasures that Arizona has to offer. 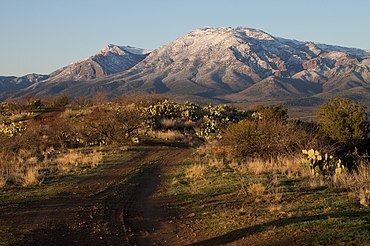 Consequently we have decided to do our best to share the beautiful terrain, the rich history, and the amazing sunsets that Arizona has to offer. In order to encourage others to go the places we go, and see the things we see in Arizona Local Natural Foods will be launching a local adventure scavenger hunt contest. The clues will take participants to some of our favorite places around Arizona, and immerse them in a bit of Arizona history. For the team that completes the journey first there will be a prize. The prize won’t be as extravagant as the treasure of the lost Dutchman mine, but we are sure we can come up with something good. Keep your eyes open in the next few weeks for the official announcement of the contest as well as the first clue! This entry was posted in Local Natural Foods News, Uncategorized and tagged local forager, local goodness, scavenger hunt. Bookmark the permalink.